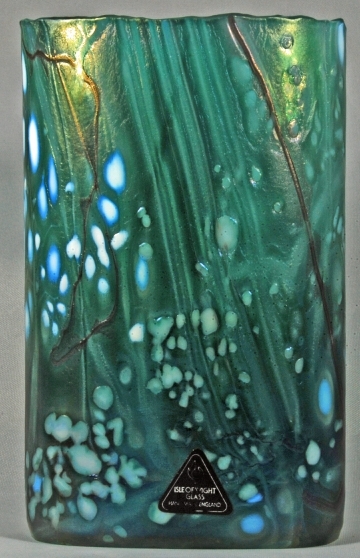 In 1984-1985, pieces received a light fuming with stannous chloride to produce a mild iridescence. Be warned that the Meadow Garden colourways are difficult to identify. They varied a lot and the colourways were not always accurately described. We have tried our best here and gained expert opinion when possible, but there may be mistakes. It is possible to confuse some of the Meadow Garden colourways with Summer Fruits. Frilled, uneven rims are characteristic of oval vases of Meadow Garden and can help identify this design when there is some doubt. Flask perfume bottle, 9.5 cm high with stopper, 6.1 cm wide and 3.5 cm deep. 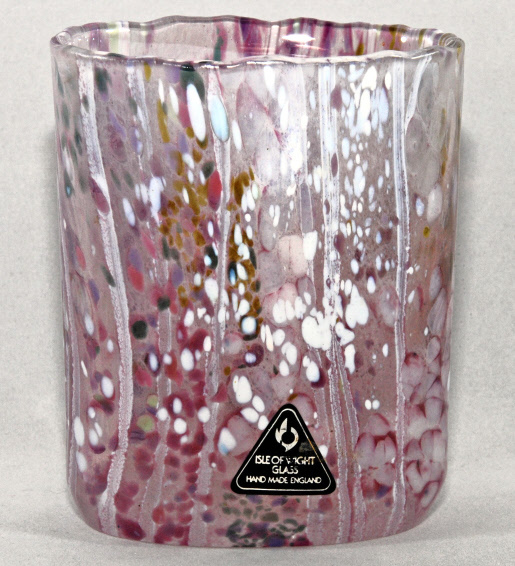 The oval vase measures 8.6 cm high x 7.1 cm wide x 4.6 cm deep. These have been confirmed by Ron Wheeler and Tim Harris. Ron described the colour as Sargasso Green. Image courtesy of Mike Collinson. 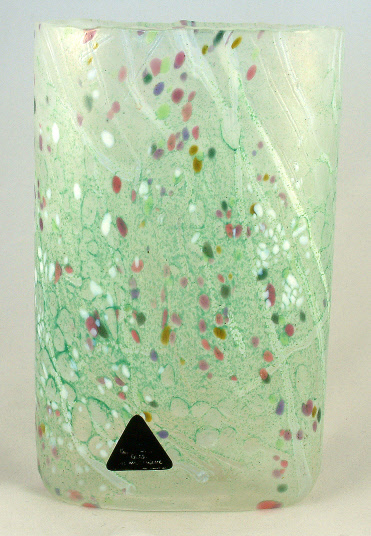 Oval vase, 12.5 cm high. It is not certain this identification is correct. 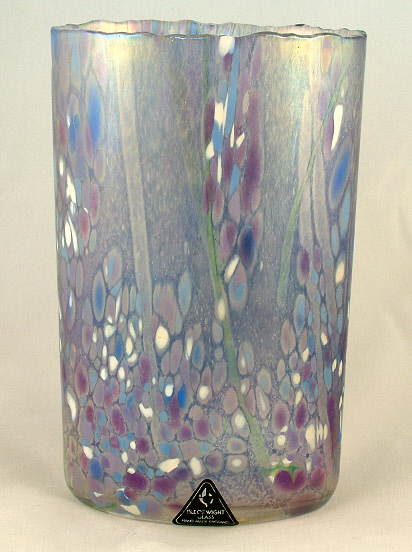 Oval vase, 13 cm high. 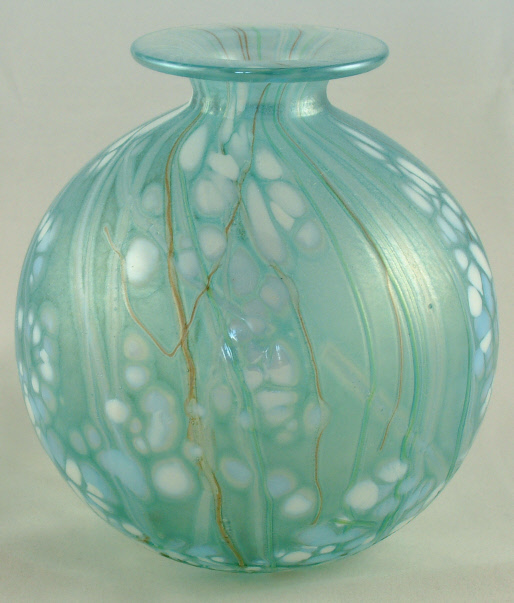 Oval vase, 12.8 cm high. 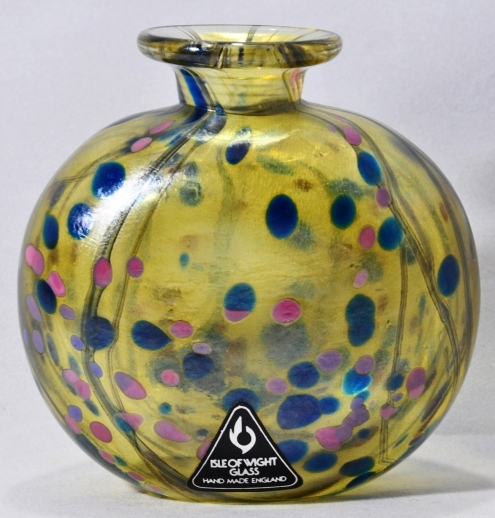 Oval vase, 8.9 cm high, 7.0 cm wide. Image courtesy of Mike Collinson. 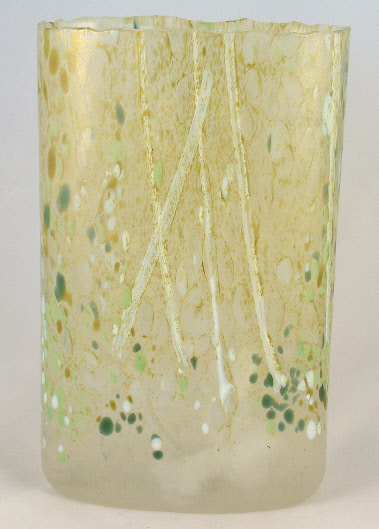 Primrose vase or a perfume bottle, but the inside neck has not been frosted. It measures 7.2 cm high x 7.2 cm wide x 4.0 cm deep. Image courtesy of Mike Collinson. 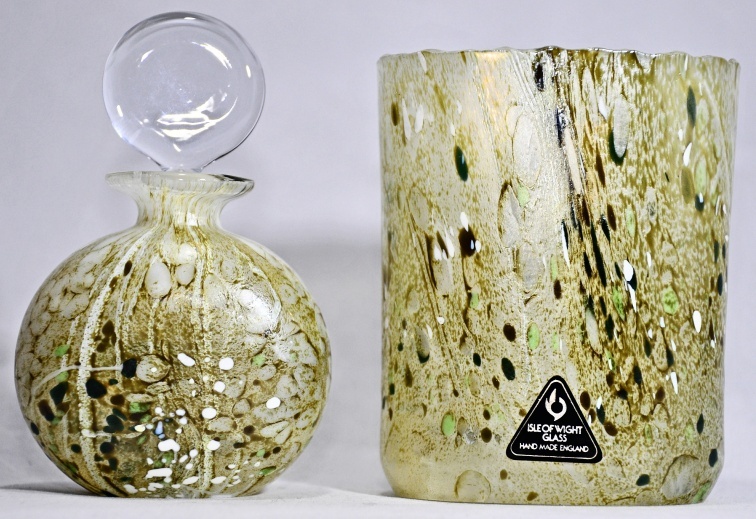 Globe vase, 11.5 cm high, 10 cm diameter. 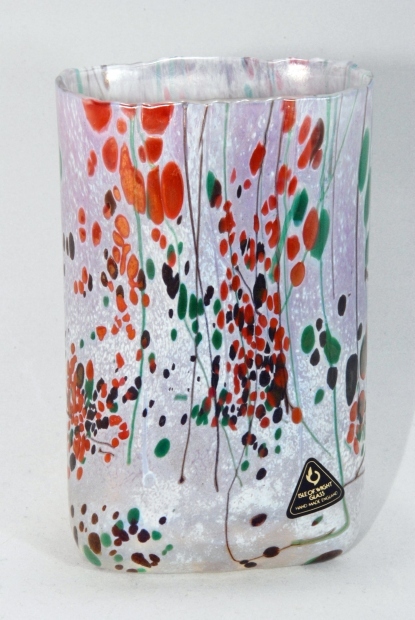 Meadow Garden Snowdrop oval vase, 12.8 cm high x 8.1 cm wide x 4.9 cm deep. The colours apparently got much darker toward the end of the production run. 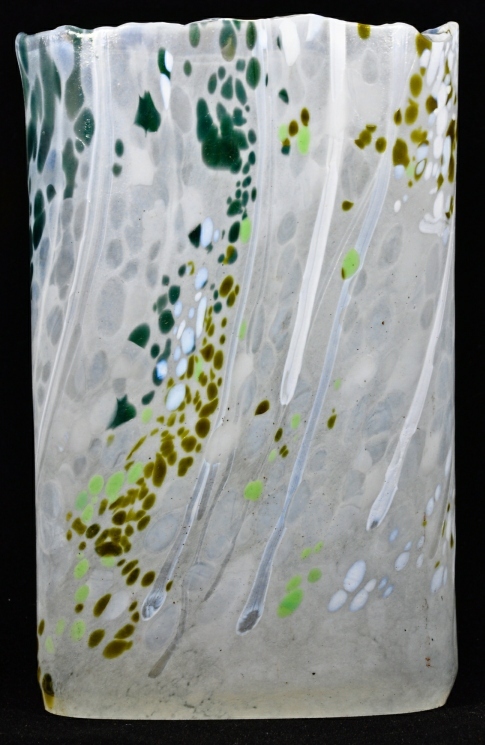 The vase has also been fumed. Image courtesy of Mike Collinson. 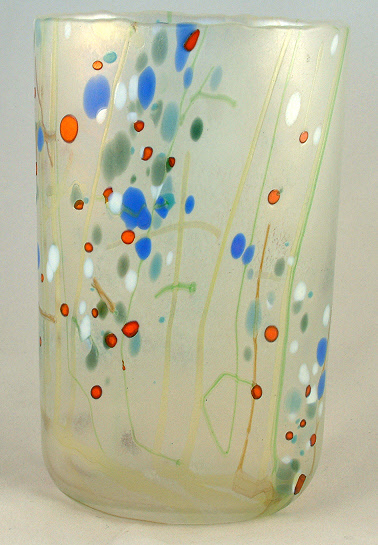 Meadow Garden oval vase in an unknown colourway, but with some similarities to Poppy. 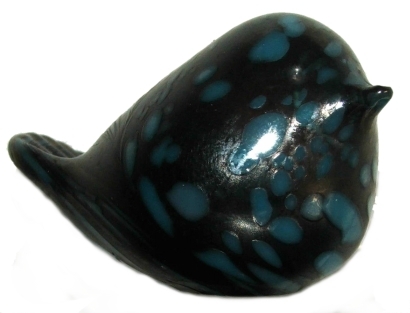 It is 13.1 cm high, 8 cm wide and 5 cm deep. Image courtesy of Mike Collinson. 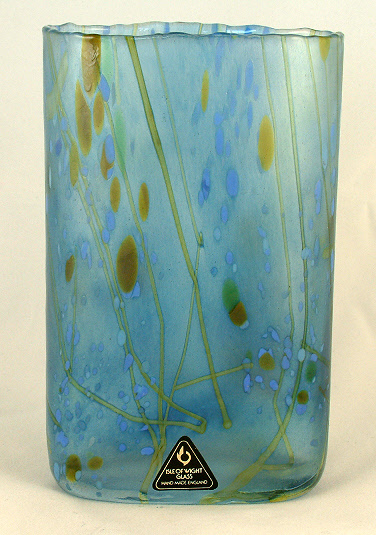 Meadow Garden oval vase in an unknown colourway, about 13 cm high. Image courtesy of Mike Collinson. Meadow Garden bird paperweight in an unknown colourway, 7 cm long x 4.5 cm high.